So many weeknights find us rushing around, making sure homework gets done, going from one evening activity to the next, that dinner is often more about the necessity of nourishing our bodies than actually dining. When Bertolli challenged me to prepare a special meal for my family using their new restaurant-quality Frozen Meal Soups and only one hour of prep time to do something special, it made me realize how rarely we turn dinner into an event. Tonight was the perfect time to put the challenge to the test. The kids had a science fair at school in the afternoon and both had evening activities. Could we pull together a quick, delicious dinner that felt special in under an hour? 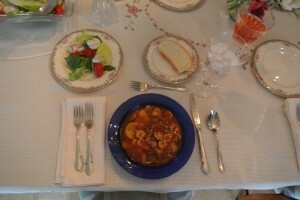 Taking our cue from the Bertolli® Frozen Meal Soup Tuscan Style Beef and Vegetable we chose, the kids and I decided on an Italian-themed night. And given our time frame, I opted for every shortcut possible. Right there on the bag it suggested fresh Italian bread. Grabbed that from the bakery section. Added some salad in a bag, already sliced mushrooms and cherry tomatoes into the cart for a quick salad. 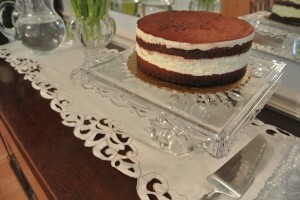 Then, sudden inspiration hit, and I steered us back to the bakery section and put a tiramisu into the cart. “Who is that for?” JavaGirl asked. 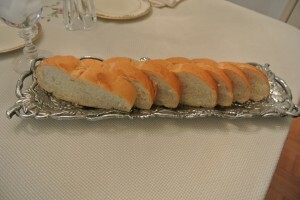 From that point on, JavaGirl made a point of letting everyone she saw know that we were having a family party that night — who knew that making a special weeknight dinner would make such a difference? It wasn’t the dessert, we certainly have dessert other nights, it was that we were make an event of things. Our last stop was the floral department. What’s a special night without some fresh cut flowers? Magazine ads, HGTV and Pinterest would have you believe that everyone else is eating dinner on beautifully set tables every night, when I would bet that I am not the only mother who long ago turned to easy-to-wipe tablecloths and doesn’t print out custom menus for her family on a nightly basis. We just don’t like to post those photos on the Web. But it is important to remember to “bring out the good stuff” not just when company comes, but also for family. Not just for special occasions, but also “just because.” So when we got home, I pulled out the special tablecloth JavaDad’s grandmother embroidered for us a wedding gift, broke out the wedding china and crystal, found some candles, and put the flowers on the table. Dinner itself was a cinch. The Bertolli Meal Soup can be cooked on either the stovetop or on the microwave and since I was cooking two bags (each bag is meant for two people) I decided to try both methods. Since this particular soup included bowtie pasta, I was curious to see if the pasta would turn mushy in either method and pleased to see it didn’t. We sliced up the bread, threw the salad together, served up the soup, and unwrapped the tiramisu and placed it on a cake stand. JavaDad poured some wine, lit the candles and dimmed the lights. Voila! A special meal on a Monday night. In addition to helping us shift our moods and slow down (briefly) between events, though we often take our kids out to restaurants, this gave us the unexpected benefits of making our kids feel special (our daughter particularly kept talking about how pretty everything was) and also an opportunity to remind our kids about table manners (break bread in small, bite-sized pieces, then butter it, eat your soup by pushing the spoon away from you). I am quite thankful to Bertolli for reminding me that a special meal does not necessarily mean one that takes a long time to prepare. It was a simple dinner, perfect for a busy night like this one, and yet with a few very easy touches, it turned into a special one. Share your tips for a special weeknight meal in the comments section! Disclosure: I was compensated by Bertolli to participate in the Weeknight Meal Special Challenge. As my loyal readers know, my opinions are always my own and I always tell it like it is, no matter what! My family liked this soup and we’re going to get more to stick in the deep freezer. My favorite part of your post – not saving things for a special occasion! Every day is a gift and should be special – sometimes we just need a little reminder! Glad Bertolli’s challenge could give you such an enjoyable evening. Looks absolutely lovely! 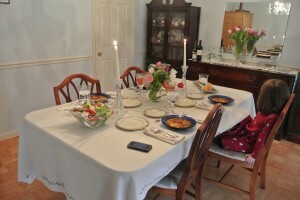 What a fun idea to have a special family dinner. 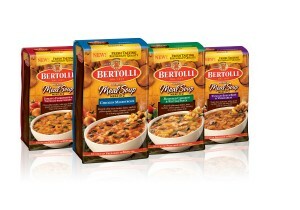 Will look for the Bertolli soup in the frozen food section. Sounds like a good back up meal for those nights I have an early meeting. I am quite thankful to Bertolli for reminding me that a special meal does not necessarily mean one that takes a long time to prepare. It was a simple dinner, perfect for a busy night like this one, and yet with a few very easy touches, it turned into a special one.